What size chart(s) do the over 50's in UK airspace carry? Having just returned from Specsavers this evening I found this thread very informative as a shortsighted lazy one eye 51yr old male. I've always worn glasses as monocles went out of fashion a while back! I'm 2.25 distance right eye, 2 in left and now in addition 1.75 near I'm both. I want to get a pair of varifocals. As I intend to wear them for flying only should I get them tailor-made? Where does the grading line go? Does a polarised coating help on the sunglasses version? Wicksay wrote: Having just returned from Specsavers this evening I found this thread very informative as a shortsighted lazy one eye 51yr old male. I've always worn glasses as monocles went out of fashion a while back! There is no grading line with varifocals : the lens strength changes seamlessly: Take your chart to the optician with you: and tell him what you want. The problem will be if you have a large correction 2.25 is pretty big, mainly with peripheral vision. There is a post by me on another thread about problems with tripping up kerbs and steps, on looking down with large correction varifocals. I made the mistake of getting varifocal photochromic sunglasses for flying/ driving which of course don't work as the screen filters out the u/v required to activate the photochromic change. IMHO varifocals are worth spending a bit of money on, especially if other lens problems like astigmatism are present. I had my eye test today, -0.75 short sight in both eyes, +1.5 long sight in both. Boots gave me a rough and ready varifocal quote for reglazing my serengeti sunglasses with their top of the range varifocal technology (called x scape or something) of "maximum £550". That includes all the coatings except polarised and photochromatic. I would of course dismiss them out of hand normally, but I also have a 25% off voucher which may bring them back into contention. My main issue is I legally do not need glasses to fly, and only have an issue with close up when I decide to wear prescription sunglasses to sharpen up distance. It seems like a lot of money for such a situation and Im sure there is another way to achieve what I need, which is essentially just distance correction which doesnt affect instrument panel and below. Maybe some kind of flip down clip on lenses which cover the top half. Get some bifocals made in China for 30 quid. Paul_Sengupta wrote: Get some bifocals made in China for 30 quid. The only issue I have with that is that the bifocal insert is normally a small section at the bottom, as pilots we really only need the distance prescription in the top 3rd - so it doesnt affect focus on the instrument panel. My prescription has come down again since last time so if I got -0.75 it probably wouldnt be so bad now, but when it was -1.25/1.5 it definitely affected viewing the instrument panel. I don't need glasses for anything other than flying at the moment, and that is just to sharpen up objects a little. SpecSavers will put the reading small section wherever you want it! You can have it at the top of the glasses if that suits your preference. I went down the route of spending 500+ quid with Boots on varifocals some years ago when they had an offer of try for a month or refund. I took them back and had the refund, I just couldn't get used to to loss of peripheral vision and the need to constantly turn your head to see things at the sides. In your situation I would work with the optician to get some bifocals made to suit you. Even with a tiny reading 'D' at the bottom just for reading my charts on my lap, I never really got used to the 'step' in early bifocals that I got initially. Plus the fact that they useless for anything else: Impossible to read the top of the Daily Telegraph without neck-cranking head tilt. My varifocals can be used for anything and double as pretty good sunnies provided I'm not behind a windscreen. At my next eye test I'll be getting non photochromic standard varifocals with sunglass lenses. Fortunately my prescription doesn't seem to vary year on year so I can spread the megabuck costs. Ever since I started powered flying back in '71, instructors have said the same thing to me; use a half mil not a quarter mil as the quarter mil 'contains too much information and it confuses students'. I was never 'confused' by the extra detail you get on a quarter mil and have always carried one as I find the 'extra detail' is most useful, showing the actual shapes of built up areas etc. Strange that instructors always seemed to use the same excuse; is it something they're taught to say in their instructor training? the one autogyro pilot whom I know uses 1/4 mil, as seem to most of the military helo pilots with whom I've flown. I guess that all that extra detail is actually useful if lowish and slowish. 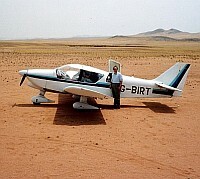 chevvron wrote: Ever since I started powered flying back in '71, instructors have said the same thing to me; use a half mil not a quarter mil as the quarter mil 'contains too much information and it confuses students'. Students are very often tempted to navigate from village to village, looking for every country cross roads, if they use the quarter mil. Using the half million encourages a broader view. So, yes, it is part of instructor training. But pottering along at 70-80 knots I find I'm much more comfortable with the quarter mil. Actually the ideal scale would be something between the two! I could never get on with varifocals. My neck used to hurt from all the movement (trying to find the bit that was in focus). I then consulted a specialist optician and for the past 25 years I’ve been using tri-vocals. Yes three lenses. The top 30% optimised for external long distance (spotting the bandits), the middle section optimised for middle distance - eg kolsman window and other instruments - and the bottom third for reading charts, iPad etc. I couldn’t imagine going back to varifocals or even bifocals. These are just perfect. Lefty wrote: I could never get on with varifocals. My neck used to hurt from all the movement (trying to find the bit that was in focus). I looked at these, even some kind of DIY version with plain sunglasses and then those stick on lenses so the available long sight ones at the bottom, and short sight across the top - but there doesnt seem to be such a thing. As far as I can see <ahem> varifocals are trifocals but the different sections are blended into each other? I did have concerns about how I would get on with the 'distortion', and the need to physically move my head more as I guess like most people I have never been aware of actually how much I already move my head in the cockpit. I believe/hope the lower the prescription the less noticeable it is going to be, so I have taken a risk with an online company to reglaze my serengeti with a varifocal lens. £105 all in, which I feel is worth a go, and means I will be happier spending more in future when my prescription gets worse. The documents, manuals and information may be available in a form other than on printed paper. An electronic storage medium is acceptable if accessibility, usability and reliability can be assured. If you read the full text there is no doubt that it applies to all textual and graphical aeronautical information pertinent to the flight. many thanks for this - I had been wondering the same and trying to find the relevant bit of ANO. Looking in wrong place it seems!